Perfect for guest rooms or children's sleepovers, this Queen size sofa sleeper features a pull out, supportive mattress that can easily fold back into the sofa when not in use. A queen size mattress combines the support of steel spring coils and the comfort of air. When not in use as a sleeper, the sofa features plush cushions and elegantly tailored track arms, giving the sofa a Contemporary look the whole family is sure to enjoy. The Pesci Contemporary Style Queen Size Sofa Sleeper by Rowe at Lindy's Furniture Company in the Hickory, Connelly Springs, Morganton, Lenoir area. Product availability may vary. Contact us for the most current availability on this product. Pillow 2- 19" throw pillows. Seat Back Loose pillow back cushions. Leg or Skirt No skirt, no visible leg. Warranty Lifetime Limited warranty on frames, springs, mechanisms, and cushion cores. One year warranty on cushions, upholstery fabrics, filling material, and fastenings. Enjoy the modern look of this upholstery collection. A sleek frame and slightly flared cushions give this collection a Contemporary look. 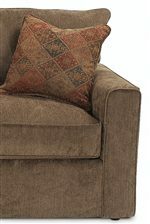 Great for your living room or den, this collection is sure to become the family favorite with plush cushions and soft fabrics. A large selection of special order fabrics allows you to customize this sofa to suit your own personal taste. The collection also features a sofa sleeper, great for overnight guests or children's sleepovers. Versatile, and functional, bring this collection into your home today! The Pesci collection is a great option if you are looking for Contemporary furniture in the Hickory, Connelly Springs, Morganton, Lenoir area. Enjoy the Look and Feel Plush Cushions, Track Arms and Soft Fabrics.